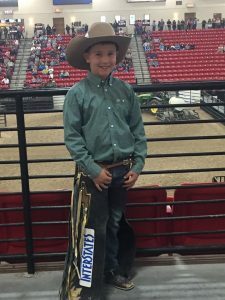 First off I would like to thank Josh and everyone at Interstates for helping me get to Las Vegas for World Finals with the MBR Miniature Bull Riders. I tried my hardest to win, but came up short; however, I’m already training for next year! I will start my next season in February in Arlington, Texas at the PBR World Cup . My favorite parts were getting on all the mini bulls and getting to meet all the PBR bull riders. Chase Outlaw being my favorite bull rider. Chase stayed across the hall from us. He invited me over to his room and we talked a lot about bull riding and he gave me a lot of great advise. He also gave me his riding glove and tape, he even signed his glove for me! I also got to hang out with Gage Gay. World finals is something I will never forget. I appreciate everyone at Interstates for cheering me on and being my sponsor. Thank you so very much.